Ruth offers exceptional instruction on the harp and violin, drawn from over 30 years of experience as a teacher and professional performer. "My goal is for my students to feel the pure joy that the magic of music can bring.....while learning about the work it takes to achieve any worthwhile activity.... and to nurture and strengthen the relationship between parents and child with Suzuki music instruction....."
Ruth started playing harp while working on an undergraduate degree in violin performance; and continued playing both professionally; achieving a Master's degree in violin performance from the University of Tulsa, and playing viola for the Tulsa Signature Symphony for 15 years. 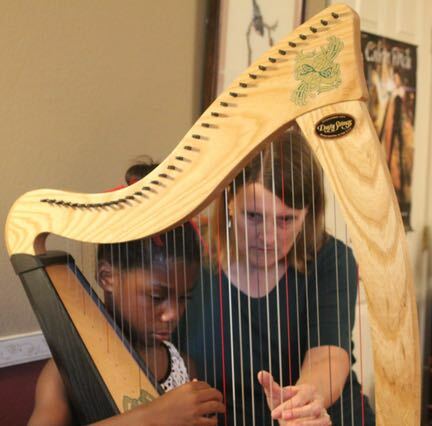 She has extensively freelanced for weddings and the like, been the Harpist in Residence for Hillcrest Hospital's Art of Healing Program, and has been a Teaching and Implementing Artist for the Harweldon Institute (Arts and Humanities Council of Tulsa) for many years. She's a member of the American Federation of Musicians Local 94, the Suzuki Association of the Americas, Tulsa Association of Music Teachers, Music Teachers National Association, and American String Teachers Assoctiation. setting is so comfortable and easy to learn in." --O.L.B.